The urban legend may be a myth ... but investment clubs have been coming together to explore long-term investing for decades. 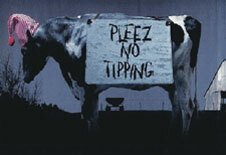 Cow Tipping in Pamplona? It may be a widely-held urban myth but it is certain to inspire collegians or high school students to attempt the tipping of the bovine. The heinous spectacle was glamorized in the recent movie, “Cars” despite the obvious cruelty of wrecking a good nap or good night’s sleep. Now I remember why they call it God’s Country. Reminders are such a good thing. As I cruised through places like Faribault, La Crosse and Prairie du Chien on the Great River Road, I remembered … The tour was sandwiched around a wonderful weekend in Minneapolis spent with a few hundred committed long-term investors. The 29th annual Investors Fair in Minneapolis was once again delivered by dedicated volunteers and attended by some of the best investors in the world. Yes, some of them raise dairy cattle and work hard. The CEO of a sponsoring company shared his perspective on why Wisc-Iowa-Minn “farmers” make such good employees, citing factors such as strong education and virtually unmatched productivity. Back when we were dating, my wife once claimed that she’d seen a cow in the field with its feet in the air — literally laying on its back. I assured her that cows sleep standing up. For years, I teased and we’d remember the incident, my disbelief … all the while ignoring the reclining cows in plain view. And then it happened … as I passed beyond Prairie du Chien, Wisconsin, I came upon a cow in an adjacent field, feet vertical. Fearful for its life (and the sustainability of the playful exchange with my spouse) I honked my horn and indeed, this bovine still had a heartbeat. Apparently cows occasionally like to stargaze? I needed to know more. So I googled “cow tipping” and discovered many things, including a reference to the User’s Guide at Manifest Investing from Expected Returns dated May 1, 2006. I’m not making this up! I continued to study this phenomenon of cow tipping and was treated to a study of forces and torques that would be required to topple a sleeping cow. I don’t know what grade these students at the University of Virginia received but the diagrams and details dealt a severe blow to the apparent urban myth of cow tipping. Among other things, I learned that cows can’t lock their knees/legs like horses and therefore, they lay down to sleep! The sojourn included a stop in western Illinois to spend a couple of evenings with my parents. I told my mother the story. All she could do was shake her head mumbling something about, “I thought I taught you better than that … and you need to pay better attention.” She led me to a closet and carefully extracted a box. She opened it to reveal a manger scene sculpted from Lladro and handed me a cow in a reclining position. “It’s been there right in front of your eyes for going on 50 years. Just when did you intend to notice?” And with that, the myth completely crumbled. What else do I believe that isn’t true? We’ll tackle this question from an investment perspective on the Forum this month as we review Ken Fisher’s book. Paybacks are … uh … Often Unpleasant. The tables are turned during the running of the bulls in Pamplona, Spain, as Bovine Nation exacts a little revenge during the annual People Tipping season. The road from Cedar Rapids, Iowa, to Minneapolis, Minnesota, passes through Faribault. What’s special about Faribault? Once again, remembering is such a good thing. Back when I served as senior contributing editor for Better Investing magazine, my responsibilities included going over fairly huge stacks of investment club portfolios. We’d examine performance over the prior year and since inception for these educational gatherings of investors and build a ranking of top-performing clubs. Although I no longer have access to the records, I keenly recall that two of the top ten clubs had hailed from Faribault, Minnesota. These particular clubs had been in operation for 20 years or more and their achievements were exemplary. Digging a little deeper, several other leading clubs were from Minnesota and a good many (documented in a Better Investing article) called Illinois home. Investment clubs are educational vehicles. They’re intended to reach out to individual investors who want to understand better and implement a strategy of effective long-term investing. It’s more about the learning than total assets. These Minnesota and Illinois clubs were too numerous to be statistically coincidental. Dig a little deeper and we’d discover people who teach and share better than “average.” My friend, Gordon Hakes, was at the epicenter of the Faribault phenomenon and he probably knows a thing or two about cow tipping and successful investors. The current generation of volunteers and leaders includes: Barry Detloff, Ilene Meade, Howie Myers, Gayle Olson, Lynn Ostrem, Jim Pedginski, Sheryl Sostarich, Shelly Stokes and John Tonsager. Another group of friends from Beardstown, Illinois, and the heart of Illinois are to be commended for their efforts to remove the mystery and fear from investing, enabling a generation of clubs to realize superior results. These ladies probably have a cow tipping story or two to share, too. Immunity to Mad Cow Corrections? With MIPAR at 9% (or less) at the present, we know that the search for the highest-quality companies is a pretty good idea right now. I was recently asked if I thought we should avoid the smaller companies under these conditions. The premise is that the smaller, less-discovered companies are treated very badly when the rhinos decide to go “bull market tipping.” There’s an element of truth to that. The smaller companies will often exhibit weaker financial strength and can be vulnerable as bull markets run out of steam. And yes, a 9% MIPAR means that there’s not a whole lot of steam right now. With current market conditions, I do think we should de-emphasize the smallest of companies while patiently waiting for better opportunities to assume ownership. That said, I don’t believe we should ever ignore any category of stocks completely. Look no further than the track record of Tom Gardner and his team at the Motley Fool’s Hidden Gems newsletter. Hidden Gems was launched in early summer 2003. We’ve tracked the results of the monthly selections as a model portfolio. The Russell 2000 (a small company index) has delivered a rate of return (annualized) of 14.7% since June 2003. Tom Gardner’s selections have generated an annualized rate of return of 24.2% over the time frame. That 4-year period certainly includes a time frame or two when smaller companies were probably less attractive. Some of the more appealing (and successful) selections include: Middleby (MIDD), Buffalo Wild Wings (BWLD), Volcom (VLCM) and Stanley Furniture (STLY). By the way, Bovine Nation recommends a standing ovation for their brother buffaloes. As I rolled down the Great River Road, admiring the vistas of the palisades near Prairie du Chien, I was reminded why these “back yards” are called God’s Country. (Few know this, but there are palisades near Cedar Rapids, Iowa too.) The cows would never forgive me if I didn’t mention Neogen (NEOG) brought to our attention by MANIFEST contributor Ken Kavula. Ken regularly discovers smaller companies of interest and shares them with our subscribers. Explore Neogen and you’ll see why the cows would tip their hats … or nightcaps … to this promising small company.